A series that has definitely gotten more thrilling and more adventurous as it goes on, The Land of Stories Book 3: A Grimm Warning does not disappoint! Teen twins Alex and Conner Bailey have been living separately from each other for the first time in their lives, with Alex staying behind in the Land of Stories to be the apprentice Fairy Godmother, and Conner carrying on with his life in the normal world. Conner has taken to writing down their Land of Story adventures, and it is this writing that lands him on a special school trip to Germany to hear the first ever reading of a Grimm Brothers' story, that has just been opened from a 200 year old capsule. What follows this seemingly harmless event, is the revelation that a 200 year old army is set to invade the Land of Stories, a magic portal, new friends (and crushes) for both twins, a new and mysterious villain, an ill Fairy Godmother, and a race against time to save the Land of Stories from being completely destroyed. 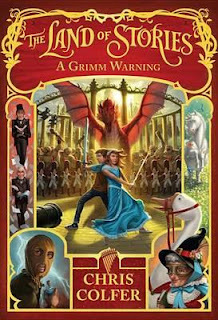 Action packed and with great links to real world historical people and events, Book 3 sees author Chris Colfer's writing develop exponentially since the first book, with his action scenes becoming easier to follow and imagine, his characters further developed, much less repetition and a new story format that veers nicely away from that of the previous two novels. There are also mysteries that are not completely solved at the end of the novel (though with some tantalising hints!) that will make you want to move swiftly to the next book.